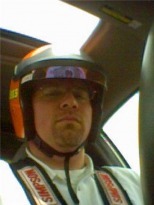 Tid Bits - MIKE THECARGUY; SUPERCHARGING THE SOCIAL IN YOUR SOCIAL MEDIA MANAGEMENT! Over the course of 25+ years in retail auto sales I have worked for and with many, many sales managers that sometimes defy logic with their motivational and management styles. For some reason the car business seems to have once been a place where dime store reverse psychology and rampant passive aggressive personalities were seen as strong leadership qualities and many folks who came up thru the ranks and now are in senior management still cling tightly to what their managers did, if for no other reason than; "that's the way its always been done..." I remember a sales manager that would always open a conversation with, "ok, lay it on me how you jacked up this deal..." I always wondered how he actually thought he could motivate me to perform better with that. Another manager I once worked side by side with would always wait until there was a group of sales people around and then ask rather loudly why he couldn't find sales people that were worth a crap, to no one in particular, and I'm sure in his mind he felt that was going to make the sales people work harder to earn his approval. It never did. As a salesman some 20 years ago I always said I would never be 'that guy' and I'm not. I have a passion for this industry and truly, truly love this business. I believe the car business can be better than we have allowed it to be, I know the business to be a respectable choice of career and I want others to see that too. People who know me describe me as ambitious, energetic and inspiring. 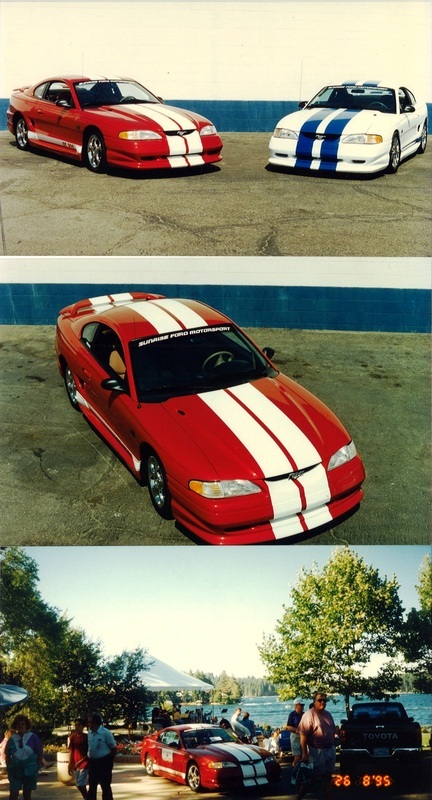 My life is driven by passion for my wife and four children -- the look and feel of muscle cars -- the smell of the drag strip -- pretty much anything 80's (music that is, New Wave, Hair Bands etc) -- AND; being a student and a teacher in the car business. I am a true motivator and have the natural talent to energize those around me. My passion and enthusiasm are intrinsic and delivered it with the sole purpose to inspire others. Most of the time, I am viewed as the "go to guy" and seen as an expert in many areas. I find myself highly respected for my well-rounded knowledge of the auto industry, but I am best known for being the guy who leads, empowers and develops his people. Instinctively, I often raise the spirits of other people by putting aside what I'm doing and giving my team member my undivided attention. With an eye for raw talent, I use this natural born gift to differentiate people by focusing on their strengths. With a desire to learn and understand the ever-changing automotive industry, I keep the book of knowledge open. I gather all kinds of innovative and cutting edge data, then keep it at my fingertips in order to ensure my organization stays competitive in the market place. Although bold and direct when I speak, those around me know they can trust what I am saying. You can count on my sincerity while engaging with others. I believe it's important to make time to meet and connect with my team, and build a platform to cultivate mutual trust and respect -- two values, of which, I will not compromise. During my daily mode of operation, I consistently leverage these values by walking the talk and delivering quantifiable results. Keeping it real, you can expect me to entertain with quick wit and a great sense of humor. I believe laughter is the best therapy and in business I provide a car buying that is extraordinarily pleasant and positively memorable. In recognition of the customers that have made the success of AllStar Kia possible and as a show of appreciation to those customers AllStar Kia of Pomona gave away a brand new Kia at their Customer Appreciation Day held today. The winning entry was drawn from names taken over the last few months of visitors to the showroom of AllStar Kia and the vehicle will be presented at the New Kia Owners Clinic in October. The name was pulled from many entries by Pomona City Councilman Tim Saunders, also in attendance were representatives from State Senator Gloria Negrete McLeod's office, CA State Assembly-Woman Norma J Torres along with many Pomona Chamber of Commerce members. Read more HERE. Today at AllStar Kia in celebration of being named the number one Kia dealer in the entire western region a brand new Kia Forte was raffled off in a drawing from names of visitors to the dealership during it first three months of business, from May until July of this year. Over 500 names were in the spinning basket and the winning name was drawn by San Bernardino the Honorable Patrick Morris himself! Also in attendance were representatives from both State Senator Bob Dutton’s office and San Bernardino County Fifth District Supervisor Josie Gonzalez. Certificates of acknowledgment were presented from both officials congratulating AllStar Kia on its achievement and also for its part in creating over 25 new jobs in the county and bringing much needed revenue to our city and county from the sale of more Kia automobiles than any other Kia dealer in California. A small but enthusiastic crowd cheered as the Mayor reached in an pulled one lucky winners name and presented it to AllStar Kia President David Choi. Hearty handshakes were shared as the Mayor welcomed David and AllStar Kia to San Bernardino and congratulated him on the achievements of his AllStar team. Read more HERE. On Wednesday July 22nd we hosted the monthly Greater Riverside Chamber of Commerce (GRCC) business mixer here at the dealership (Raceway Nissan) and it was a huge hit! Over 200 attendees enjoyed valet parking, great food and an evening of some serious networking! I am working on uploading more pictures but the first are up here, with more being posted daily. The evening could only have been made possible with some fantasitic assistance from the real pros at 'As You Like It Catering' and 'JZ's Party Charms, I know how to sell cars but these folks know how to throw a party! Thank you to all the attended and supported our event, we are doing it again next year so save the date! Today a friend at work who is relatively new to the car business asked me what was the weirdest trade in vehicle I have taken in was. This got me thinking, it HAS been 22 years now so there have been many unusual things traded in!! Things like a big screen TV, boats, motor homes, trailers and of coarse the chopper pictured here... Interesting story, young single guy living up north moves to sunny southern California bringing his dream bike with him. He had worked hard to custom order and buy this bike, every detail was all his creation, paint, pegs, engine and overall theme. Then it happened, his new So Cal girlfriend called with the news, yup, pregnant! Time to trade the sporty little coupe for a family sized SUV, trouble was he owed a lot on it and wasn't able to get the SUV without some serious help. This is where the bike comes in, it was paid for and the decision had to be made........ Well, that's how it came to sit on the showroom floor right behind my desk! This pic was shot with my camera phone the day the whole seller came to truck it away..... It so made a great conversation piece and I missed it after that!!!!! Now for weird, there's a whole other entry yet to be filed about the THINGS I have found IN trade ins!!! ..."a Honda representative said his lot caters to a different type of customer. "Honda buyers tend to be more educated about the vehicle," said Mike Correra, a sales director for Canyon Honda in Glenwood Springs. "It's a topic of discussion." Quality, engineering, reputation, and safety are among consumers' biggest issues, he said, with clean emissions not far behind. Still, he said Honda displays vehicle emission sticker information on the windows of all its cars to show its commitment to clean air standards and has done so well before it was required to. "Honda is the cleanest manufacturer in the world. It's one of the few manufacturers that doesn't have to build a car specific for California. 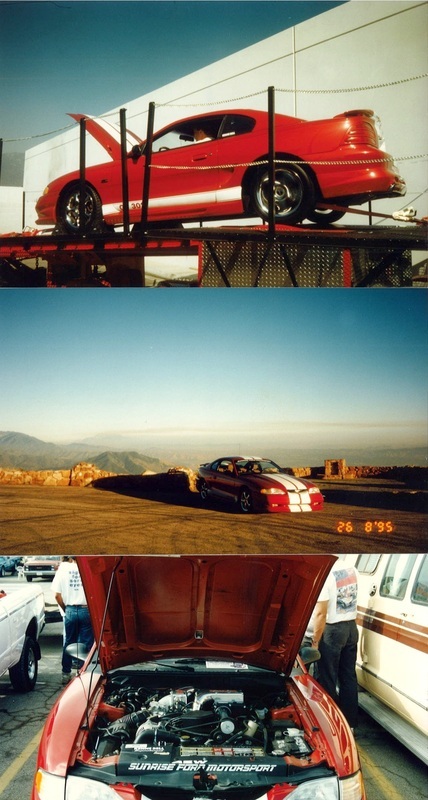 (California has some of the strictest emissions testing in the nation)." EPA data lends support to Correra's claims, with all of Honda's models scoring much better than average in its study." Honda American Mtr Co., Inc.
Lyle Sweetner, American Honda Motor Co., Inc.
American Honda Motor Company, Inc., would like to congratulate the 10 winners of the 2005 Honda Walkaround Competition, a nationwide contest designed to test the product knowledge, presentation skills and techniques of sales consultants at Honda dealerships across the country. Michael Correra of Penske Honda is our Zone 1 winner and he will compete in the national finals in Marysville OH in August. Michael and the 9 other winners from across the nation have all demonstrated a strong command of product knowledge and superb selling skills. Spanning 1,017 dealerships across 10 zones, the 10 winners first participated in this groundbreaking event at their own dealership level, and then advanced to compete at the zone level where the sales consultants were given the opportunity to presnt the product features of a Honda Pilot EX to a live professional actor who portrayed an actual customer. The consultants were judged on their ability to accurately determine which features/benifits best suited the customers buying motivations, as well as their ability to match the customers pace, focus and communication style. 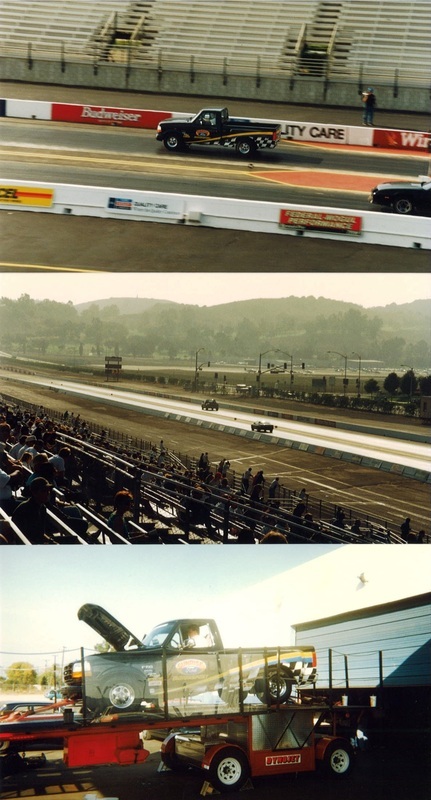 As a reward for their achievement, each National Walkaround Winner was given a check for $1,000.00 and in August will be flown to Ohio for an exclusive tour of the Marysville, Ohio manufacturing plant and a day of performance driving and training at the famous Mid-Ohio Sports Car Course. In addition a formal Recognition Event and Banquet in Columbus, Ohio has been arranged for August 20-23 for the 10 winners and their families. The final competition will be held live in front of over a thousand Honda employees and executives, we wish Michael and all the winners good luck in this groundbreaking competition! 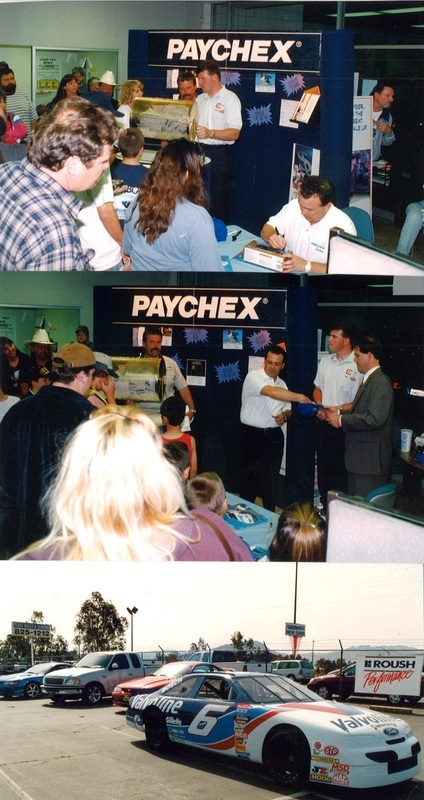 While working for LJ Snow Ford I put together a number of events including a car show on the lot and a car give away that pulled in over 1500 registrants and the winning tickets was pulled by special guest Brett Bodine! 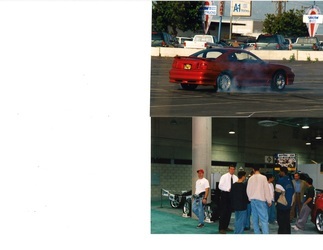 I was also the highest volume salesperson in California that year selling Roush products and equipment and was asked by the folks at JR's Garage, which is Roush west coast, to work in their booth at the LA Auto Show that year! After one of our vendors brought in a high performance package that they had developed for the very popular mustang line and had everyone gawking at it under the hood and begging for test drives; my GM at the time overheard me cynically remark that I could do better and do it cheaper! 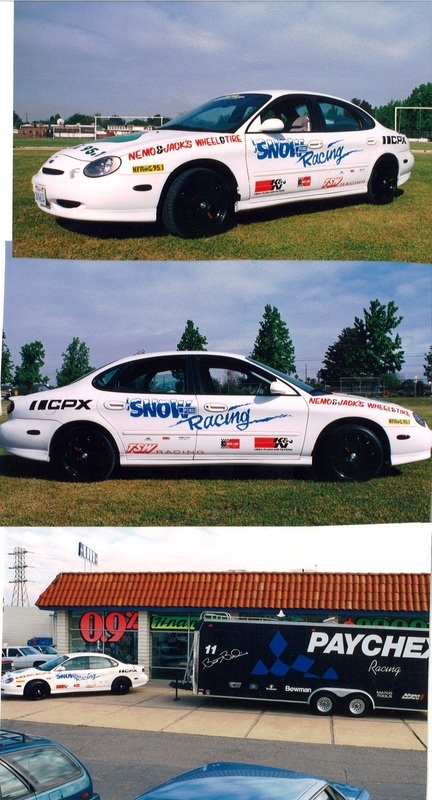 He challenged me to prove it and thus the Sunrise Motorsports Division was created. 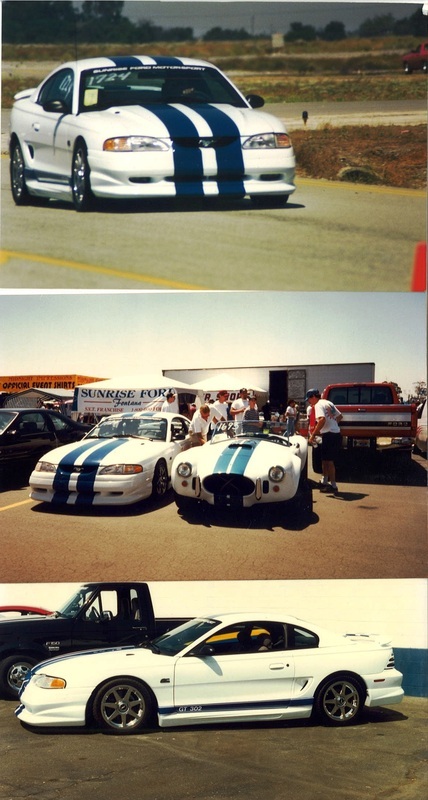 As a former fully certified Ford Technician I was in a unique position that allowed me to do most of the mechanical work myself a couple of days a week and then take the vehicles out to various events and displays myself. 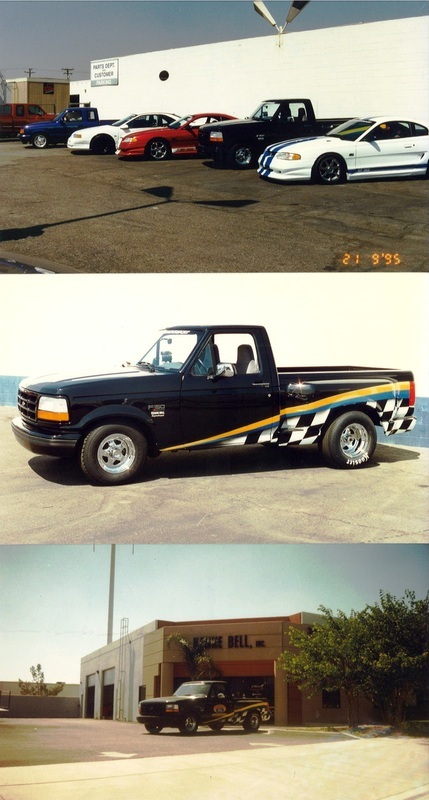 We eventually created a total of 11 special edition Mustangs, a 'race truck' F-150, a couple of Thunderbirds and even a performance Ranger! 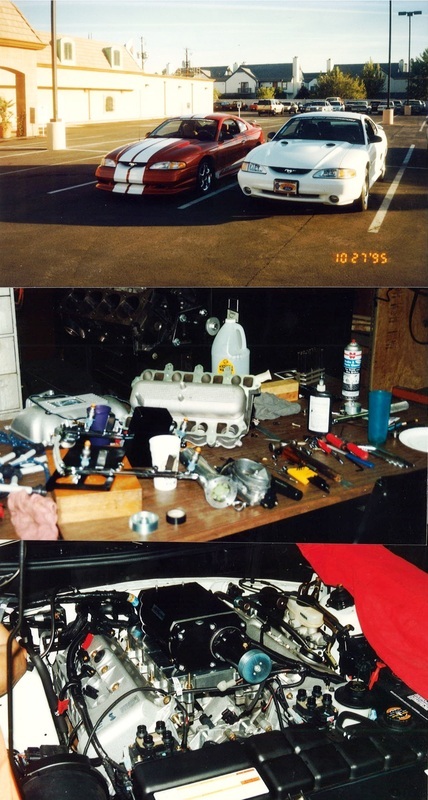 I had contacts at Kenny Bell, Accufab Eng and AEW that I worked very closely with and leaned on heavily for their expertise, with their guidance and tech support we built some really amazing cars and had a lot of fun doing it. 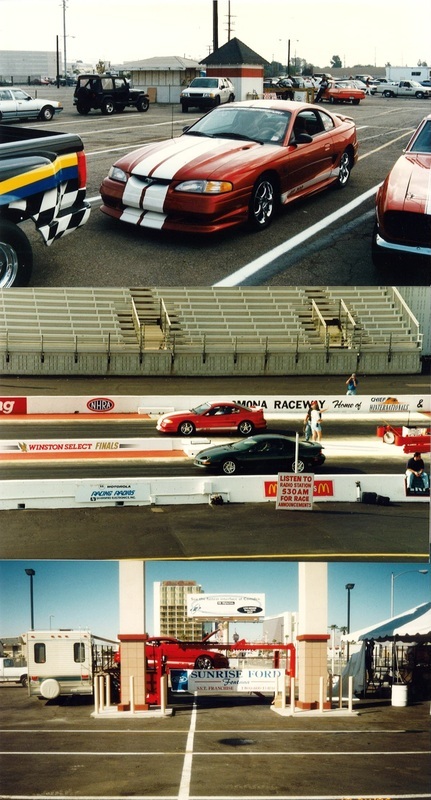 We were invited to display one of our cars at the 1995 SEMA Convention, it was featured in the DynoJet Display along side the ONLY functioning supercharged 1996 Mustang Cobra which we had delivered to John Mihovetz at Accufab only 2 days before the show! 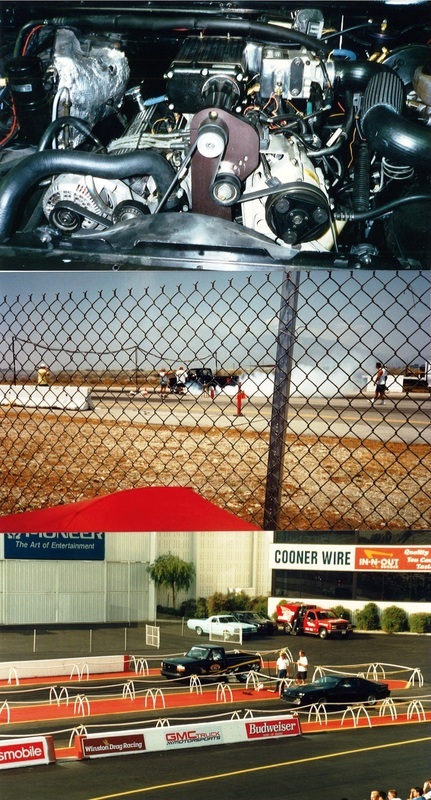 I drove it to the shop in Rancho Cucamonga and helped disassemble the top end then stood back and watched in awe as John fabricated the intake and fit a Kenne Bell Supercharger to the 4.6 twin cam Cobra engine. 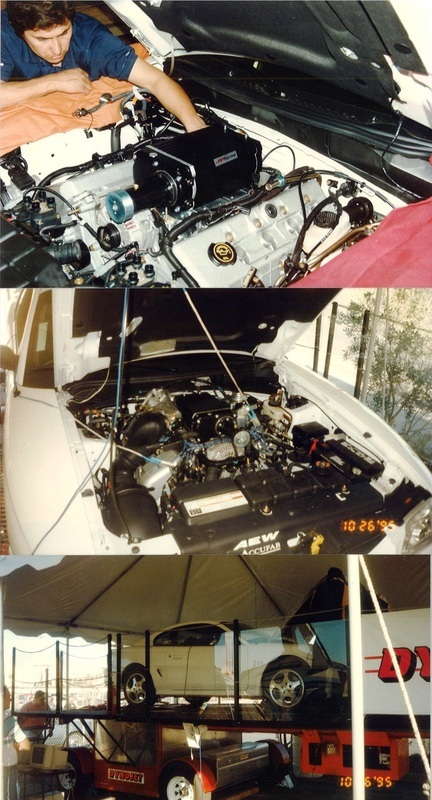 We stole the show that year with that 'Stang as the folks at Vortech, Powerdyne and the others had only mock up models of engines on stands at their booths and we had a working blown Cobra on the dyno in our booth! I next took a '95 standard cad F-150 off the line and our team of tech's, including Kirk Swanson now of K&N Filters, built a race truck complete with a blown 351 crate motor, behind the axle custom bed mounted fuel cell and the strongest built C6 race trans this side of Indy! Low 12's and lots of fun in our lil 'Parts Chaser' truck! We sold a ton of vehicles from the exposure of our Motorsports Division, our Parts Department loved the additional parts sales and we made a ton of life long friends!